Author: Erika M. Baardsen, D.O. Senior Author: Ling Zhang, M.D. Cite this page: Baardsen E.M. Polycythemia vera. PathologyOutlines.com website. 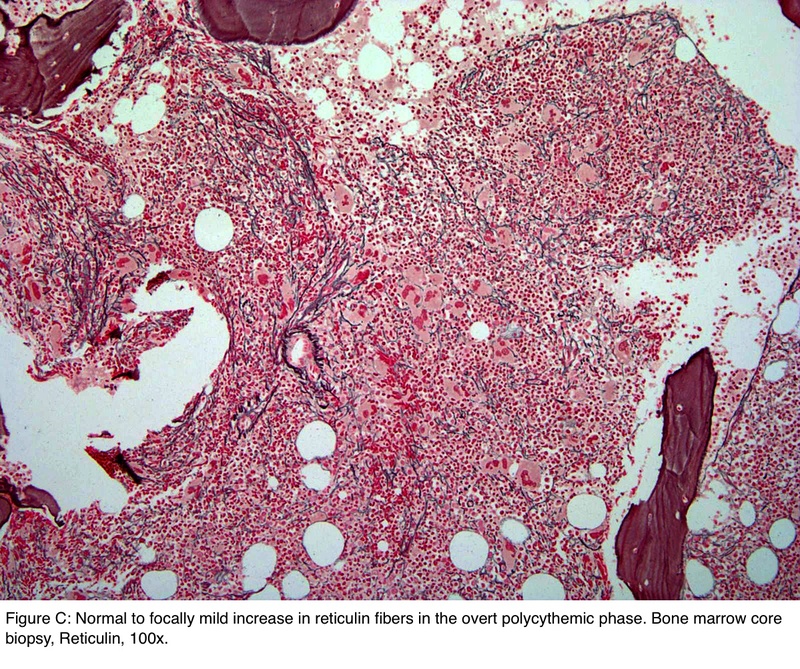 http://www.pathologyoutlines.com/topic/myeloproliferativePV.html. Accessed April 19th, 2019. Hemoglobin levels > 18.5 g/dL (hematocrit, 55.5%) in men or > 15.6 g/dL (hematocrit, 49.5%) in women, if major criterion 3 and the minor criterion are present. Images contributed by Erika M. Baardsen, D.O. and Ling Zhang, M.D. 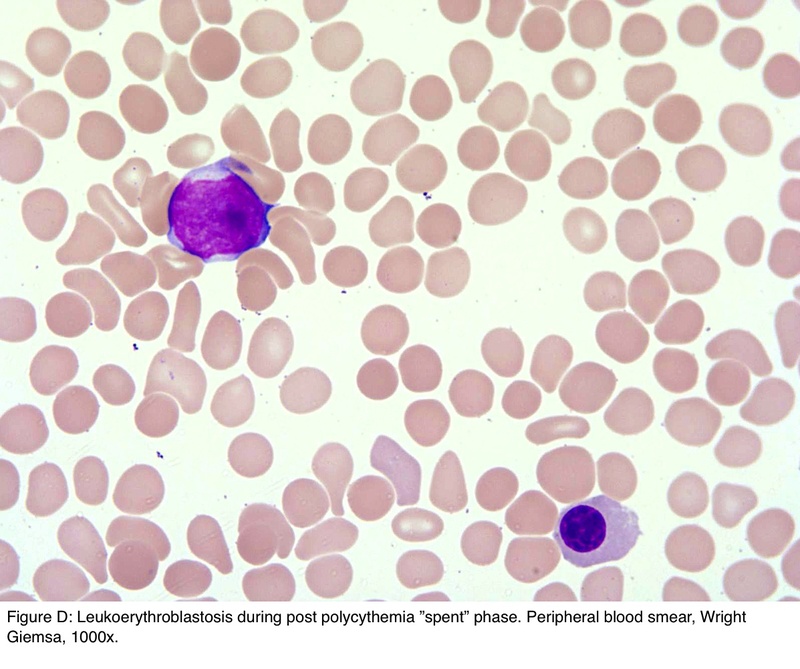 Which of the following is most reliable to establish a diagnosis of primary polycythemia? A. JAK2 V617F and JAK2 exon 12 mutations are not only found in PV but detection is fairly sensitive and is identified in nearly all patients with PV (Am J Hematol 2017;92:94). Whereas answer choice B is a major criterion, elevated hemoglobin can be seen in other conditions and would not be the most reliable. 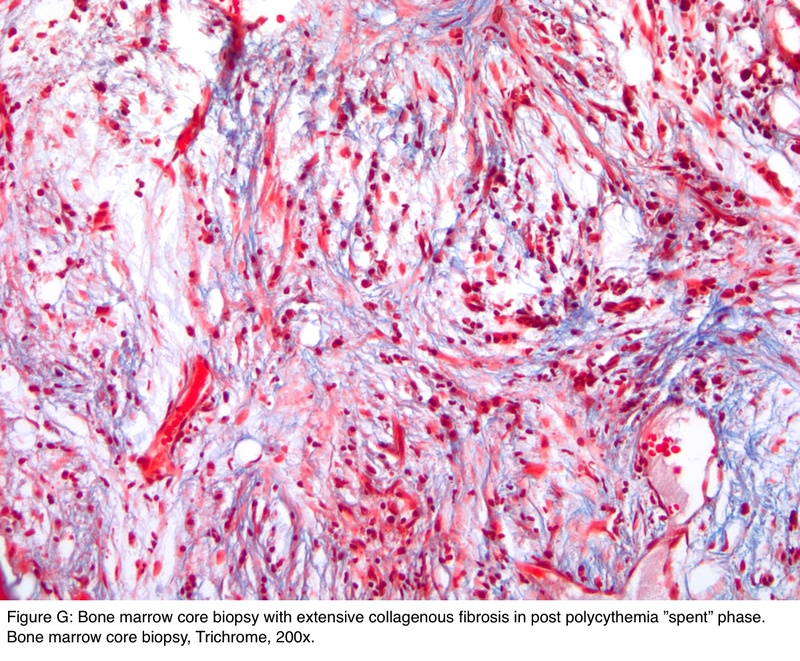 Marrow fibrosis (answer D), especially grades 2 and 3, can represent the post polycythemic / spent phase but may also be found in other conditions, such as primary myelofibrosis (PMF) or secondary changes after direct exposure to radiation therapy. 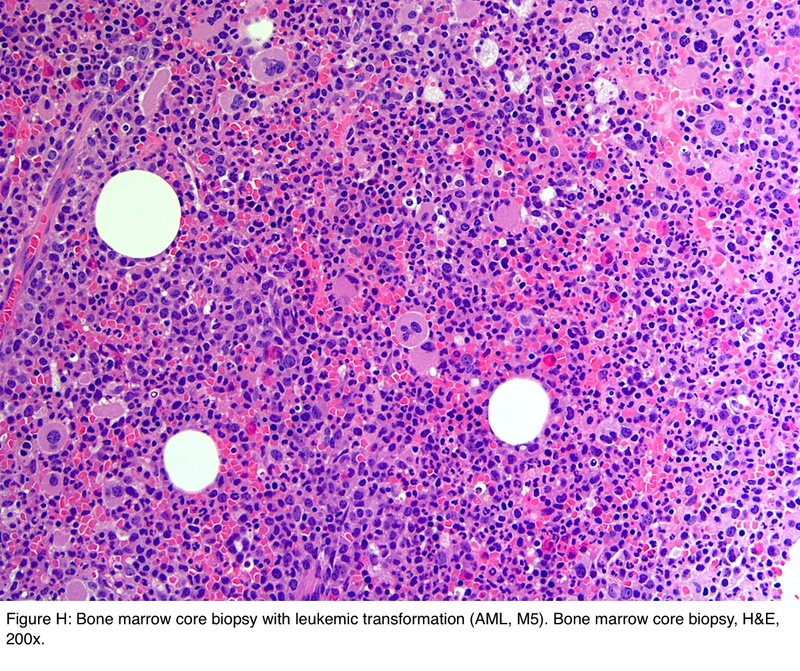 The presence of Philadelphia chromosome (BCR-ABL1 gene fusion product, answer E) is associated with CML and in some cases of AML. Increased EPO levels (answer C) are associated with secondary polycythemia or administration of EPO agonist for treatment of anemia. 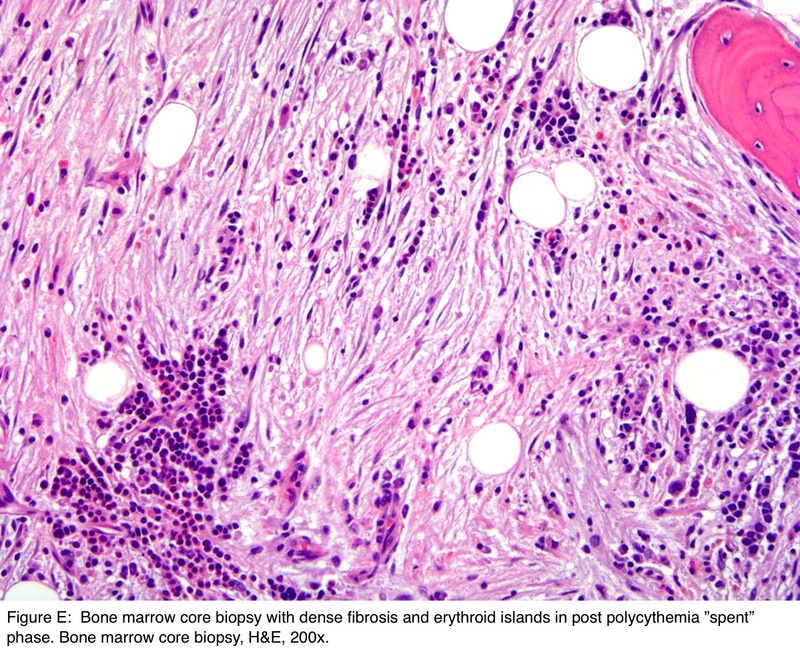 A patient undergoes bone marrow biopsy. 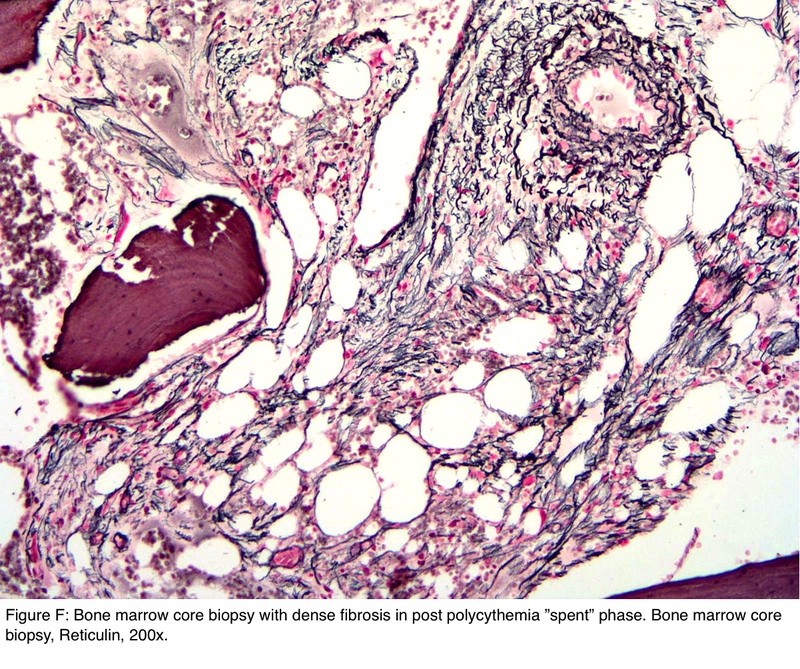 Reticulin staining of the core reveals myelofibrosis grade 3. Which of the following is the most reliable in differentiating post polycythemic / spent phase of PV from PMF? 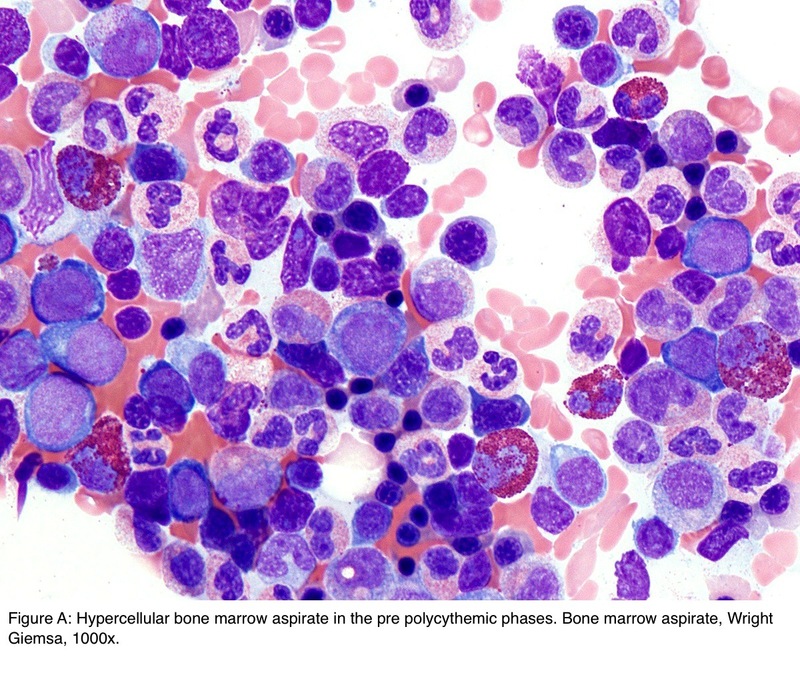 D. In addition to bone marrow fibrosis grade 2 or 3, documentation of a previous diagnosis of WHO defined PV is required to diagnose post polycythemic/spent phase and would be the most reliable in differentiating the post polycythemic / spent phase from primary myelofibrosis. 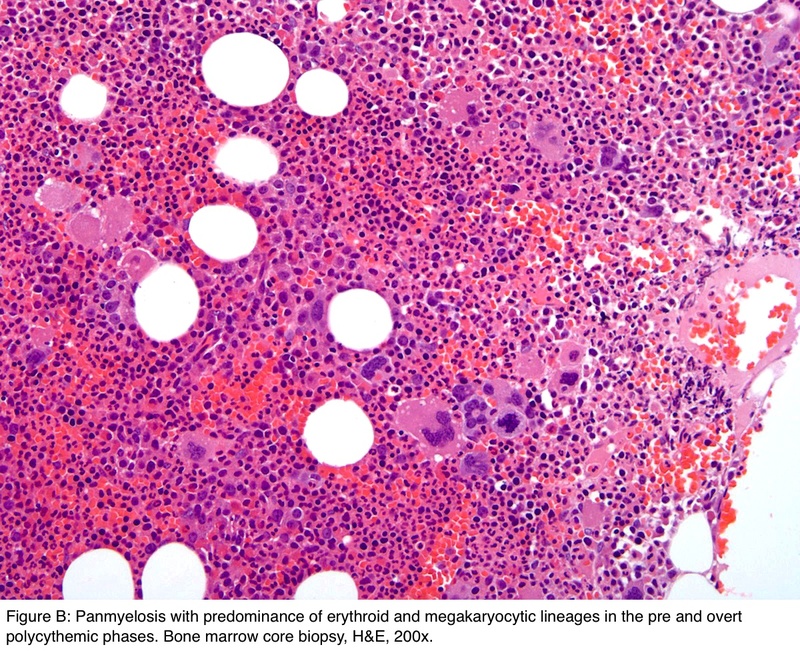 JAK2 mutations (answer A) are detected in > 95% of PV patients; however, they can also be detected in other conditions such as PMF (approximately 50% of cases). 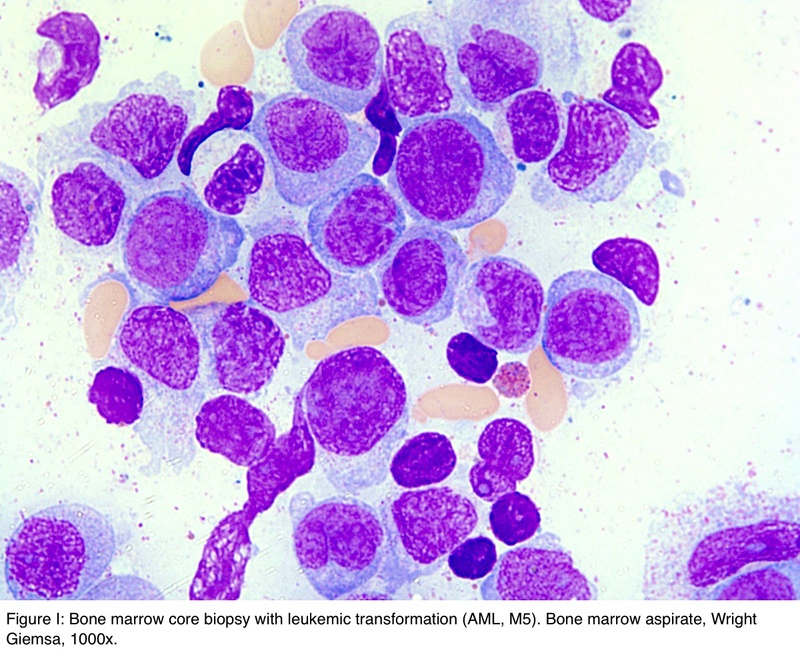 Detection of MPL mutations (answer B) has been reported in up to 5% of PMF cases and some cases of essential thrombocythemia (ET) but has not been reported in PV (Leukemia 2017 May 31 [Epub ahead of print). Low EPO levels (answer E) are characteristic of PV but can also be seen in several other conditions, including diseases associated with inherited EPO receptor mutations. The predictive factors, prognosis, natural disease progression and treatments are different for PV and PMF, making distinction between the two diseases important (answer C).